Gwyndolyn Styarfyr joined the bar in 2016 after graduating from Lewis & Clark Law School in Portland, OR. She grew up in Roseburg, OR and graduated from Douglas High School. 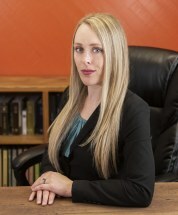 She is a member of the Oregon Criminal Defense Lawyers Association, as well as the Criminal Law, Juvenile Law and Family Law sections of the Oregon State Bar. She joined the Arneson Group in October 2016 to better the community that raised her.